It’s an unfortunate fact that most people have stubborn areas of fat that they don’t like. Muffin tops that won’t go away no matter how many sit-ups we do, love handles that no-one really loves, a post-baby belly long after the little one has grown up…and the list goes on! However, our CoolSculpting Brisbane experts at About Face Brisbane can help you when your diet and exercise regime just won’t shift those annoying fatty bulges through providing an exciting non-surgical fat reduction treatment called CoolSculpting. CoolSculpting was developed by Harvard Scientists to harness the power of controlled cooling to remove stubborn areas of fat without surgery, needles, or downtime. CoolSculpting treatment works by cooling fat cells, which then crystallise (freeze) and are safely eliminated (forever!) by your body’s natural detoxification processes. This FDA-approved procedure removes an average of 20% of fat from the targeted area after just one treatment session. About Face Brisbane are Brisbane’s CoolSculpting experts, having been trained in Austria by one of the scientists who invented the procedure. 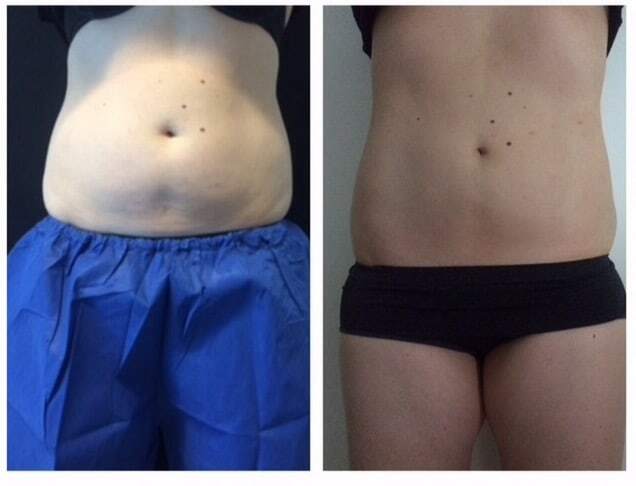 We’re excited by the amazing results we’ve had by using our expertise to help our patients to reduce stubborn fat. How are our CoolSculpting Brisbane treatments done? CoolSculpting is a non-surgical fat reduction treatment. This non-invasive, innovative treatment selectively targets localised bulges of fat that have not responded to exercise and a good diet in areas such as the back, abdomen, flanks/sides and chin. How do I know if I’m a good candidate for CoolSculpting? If you have stubborn fat bulges that don’t respond to a healthy diet and regular exercise and are close to your goal weight, you’re a great candidate for CoolSculpting. CoolSculpting is suitable for adults of all genders. As CoolSculpting will contour your body, not help you lose weight, it’s recommended for people with a normal Body Mass Index and is not suitable for obese people. Before your treatment, you’ll have an obligation-free consultation with one of About Face Brisbane’s qualified CoolSculpting specialists. During this consultation, a treatment plan will be recommended for you, taking into account your areas of concern, expectations and goals. Some patients will only require one treatment session to achieve the results they are hoping for. We’ll also let you know about the latest cooling-assisted fat reduction treatment on offer at About Face Brisbane – CLATUU 360° FREEZE. After this consultation, you can choose to proceed with your treatment right away, or you may prefer to take some time to consider your options and make an appointment at a later date to commence treatment. You’ll sit or lie on one of our comfortable treatment chairs in a private room in our North Lakes clinic while a protective gel pad is applied to the target area. Next, the treatment applicator head is strategically placed over the gel pad. When the CoolSculpting machine is first turned on, you may experience a pulling or tugging sensation as the machine uses a vacuum to draw the fatty tissue up into the applicator head. For the first five or ten minutes of the treatment, you’ll probably feel intense cold in the area that is being treated as the fat cell cooling process begins. These feelings are very tolerable and will subside very quickly. During the treatment, you’ll be able to enjoy some me-time! You can read, surf the internet, or even go to sleep. 20% to 25% of the fat cells in the target area will crystallise during the treatment. After one hour, the machine will be turned off. Once the applicator head and gel pad have been removed, your treatment will be over, and your journey to a more sculpted body will begin! No needles or incisions are involved, and no anaesthetic is needed for the treatment, so there is no downtime – you can continue with your day as soon as your treatment session is complete. No post-treatment care is required. Although results won’t be visible right away, your body will get to work immediately, and over a period of two to four months following your treatment, your body will naturally break down the crystallised fat cells. These fat cells will be safely and naturally flushed from your body. Results are noticeable after only one treatment, but to transform your body dramatically, multiple sessions will most likely be needed. Why trust About Face Brisbane for your CoolSculpting treatment? We were trained by the best. Dr Colin Campey and Karen Campey met the inventor of CoolSculpting®, Dr Rox Anderson (a Professor in Dermatology at Harvard Medical School, USA), in Innsbruck, Austria in October 2010. Colin and Karen received expert training and together with Dr Anderson, they analysed the results of the first trials of the process. Having more than 5 years experience, we know how to achieve optimal results. We have excellent attention to detail. We have a great safety track record. We get proven, good results. We treat you like a valued client, not a number. We have a fully qualified resident doctor that is available for initial and ongoing consultations. HOW MUCH DOES A SESSION OF COOLSCULPTING COST? CoolSculpting costs $880 per application. One area can be treated per application. CoolSculpting treatment payment plans now available via zipPay, however we are not registered for zipMoney. For any other questions you have regarding CoolSculpting, please contact our friendly team on (07) 3482 2999 or email us at info@aboutfacebrisbane.com.au. If you would like to learn how About Face Brisbane can help you save time and money while getting you even better results than CoolSculpting can deliver, please visit our CLATUU 360° FREEZE page to learn about the latest body-sculpting procedure available in Queensland. WHAT IS THE SCIENCE BEHIND COOLSCULTPING? Cryolipolysis™ is the name of the CoolSculpting procedure developed by Zeltiq™. Cryolipolysis™ was discovered by Dr Dieter Manstein and Dr R. Rox Anderson at Massachusetts General Hospital (MGH), Boston, a teaching affiliate of Harvard Medical School. The two world-renowned dermatologists and their team at MGH demonstrated that fat cells are much more easily damaged by cold than other surrounding cells and tissues. This means that fat cells exposed to controlled cooling down to a precise temperature can be removed safely with no harm to the skin or surrounding cells occurring. Scientific evidence on the effectiveness of the revolutionary CoolSculpting Cryolipolysis procedure has been published in more than 60 peer-reviewed abstracts and papers. WEIGHT LOSS AND FAT REDUCTION ARE THE SAME THINGS, AREN’T THEY? No, weight loss and fat reduction are actually very different, due to what happens to your fat cells. Once we reach adulthood, the number of fat cells in our bodies doesn’t change through natural processes. When people gain weight, they don’t grow extra fat cells – their current fat cells just get bigger. Conversely, when people lose weight (through diet, exercise or illness) their fat cells shrink in size, but the total number of fat cells in their bodies does not change. CoolSculpting has a very different effect on fat cells in comparison to weight loss. A CoolSculpting treatment will remove (forever) between 20% and 25% of the total number of fat cells in the treatment area. HOW ARE COOLSCULPTING AND LIPOSUCTION DIFFERENT? CoolSculpting and liposuction both produce good body sculpting results through permanent removal of fat cells. However, the treatment processes – before, during and after, are vastly different. Liposuction involves twilight or general anaesthetic, incisions, and oral antibiotics, whereas CoolSculpting treatments do not involve any of those things. There is no recovery period involved with CoolSculpting, as it is non-invasive, whereas following a liposuction procedure there is a moderate recovery period. Liposuction patients need to wear a compression garment (for almost 24 hours a day) for at least four weeks post-surgery.